You can easily communicate with your staff via Ascend. In order to email anyone from Ascend, your system must be set up to send emails. In order to email a specific User from Ascend, an email address must be entered for that User. 1. From the Ascend desktop, select View > Users or the Database Explorer icon > Users. 2. In the upper section on the right, highlight the User you plan to email. 3. 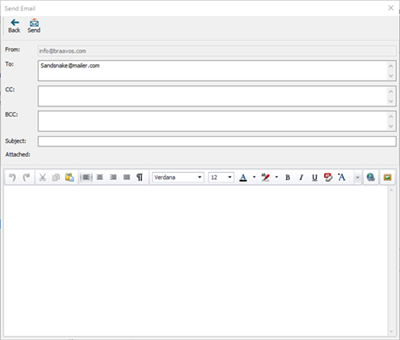 Select the Email icon fro the toolbar. The Send Email window opens with an email addressed to the User you selected. Add a Subject and fill out the email text as needed.